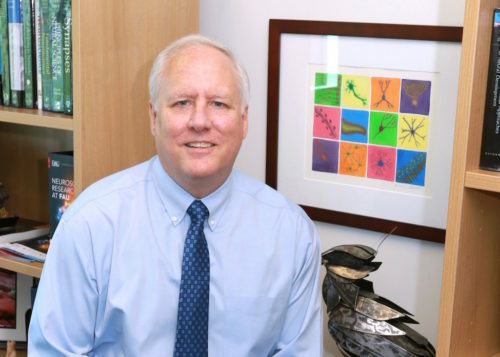 Dr. Randy Blakely is a Professor of Biomedical Science at Florida Atlantic University and Executive Director of the Florida Atlantic University Brain Institute. Randy received his B.A. in Philosophy from Emory University and his Ph.D. in Neuroscience from the Johns Hopkins School of Medicine. He next conducted postdoctoral research at the Yale/Howard Hughes Medical Institute Center for Molecular Neuroscience. Randy was an investigator and faculty member at Emory University and Vanderbilt University before accepting his current position at Florida Atlantic University. Randy is the recipient of numerous awards and honors for his research and mentorship. He was awarded the Daniel Efron Award from the American College of Neuropsychopharmacology, two Distinguished Investigator Awards from the Brain and Behavioral Research Foundation, a MERIT Award from the National Institute of Mental Health, a Zenith Award from the Alzheimer’s Association, the Delores C. Shockley Partnership Award in recognition of minority trainee mentorship, as well as the Astellas Award in Translational Pharmacology and the Julius Axelrod Award both from the American Society for Pharmacology and Experimental Therapeutics. In addition, he is a Fellow of the American Academy for the Advancement of Science. Randy joins us in this episode to talk more about his life and science. Randy lives in beautiful South Florida near the Everglades, so getting outside to enjoy nature and observe the local wildlife is a lot of fun there. While commuting between campuses, Randy listens to a variety of audiobooks, and he loves to read when he gets the chance. As a former resident of the Nashville area, Randy is also a big fan of music. Though he doesn’t play an instrument himself, he enjoys singing along to his favorite Americana and folk music songs. In the lab, Randy studies how chemicals in the brain called neurotransmitters work. Neurotransmitters allow cells in the brain (neurons) to communicate with one another. Randy is examining how neurons control neurotransmitter signaling, as well as how medicinal drugs and drugs of abuse impact neurotransmitters. He is interested in how normal neurotransmitter regulation and changes in neurotransmission due to drugs ultimately impact behavior. Projects in Randy’s lab are examining multiple neurotransmitters, various brain diseases in which there are changes in how neurons communicate, and different drugs that may modify connections in the brain by impacting neurotransmitters. Randy grew up in a small community in South Georgia where it was typical to focus on learning a trade and getting a job as a carpenter, electrician, automobile manufacturer, cotton mill worker, or another working class position. Though Randy was smart and capable, he didn’t really have big aspirations for himself. He attended a local vocational high school where he fortuitously transferred into a Vocabulary class freshman year that was taught by a woman who would become his mentor. Randy took that same class every year afterwards, and his teacher Jane encouraged him to be an intellectual, think big ideas, push himself further, and go to college. After scoring well on a National Merit Test, Randy was excited to receive a full scholarship to Emory University in Atlanta. Randy majored in philosophy there, but trying to understand the material basis for thought drove him to ultimately pursue neuroscience. While in college, Randy uncovered details about his own family history that further intensified his interest in understanding the brain and working to try to help people who have disorders of the brain. There have been a lot of challenging times when experiments didn’t work, he couldn’t figure things out, and he began to wonder if he’d be able to continue following his passion. Being optimistic, being open to unexpected findings and opportunities, and talking about these challenges with colleagues helped Randy get through these difficult times. Though Randy has had many scientific victories, he is most proud of the successes of the trainees who have come through his lab. He has trained over 30 PhD students, around 30 postdoctoral fellows, and multiple visiting faculty members. These individuals have gone on to lead wonderful and productive careers, and some have established successful research labs of their own where Randy can continue to collaborate with them. It is motivating to talk to the people he mentors, and he appreciates the opportunity to repay some of the help he has been given by his mentors over the course of his career. There are two scientific travel destinations that hold a special place in Randy’s memory. He had a phenomenal experience traveling to Erice in Sicily for a conference that was held in an old monastery on a mountain above Palermo. The view of the ocean out his window was spectacular, and it was a wonderful scientific meeting. The second place was in Maintenon, a small town outside of Paris where Randy organized and attended a small scientific conference. They stayed in a hotel that was just steps away from a magnificent chateau with picturesque gardens. When you walked through the grounds of the chateau, it felt like you were being transported back hundreds of years. Randy started a tradition in his lab group where he adds a bit of fun and humor to the introductions of the thesis defense presentations of his students. While a thesis defense is a serious and momentous occasion, Randy tries to make it memorable and personal as well. He has incorporated surprise videos, funny skits, and other methods to share stories about who the students are, where they come from, and what they aspire to do in the few minutes before they begin their big presentation. Trust yourself and your own insights. Accept lessons from other people and know what your limitations are, but make sure these limitations don’t keep you from pursuing your passions. If you come across something you don’t understand, that is the time to stop and dig deeper to figure it out. Also, for those who come from a disadvantaged background where there are limited opportunities, remember that you have potential and, and you can do great things. For teachers and mentors of students, be observant and try to recognize these individuals who may not know about all of the exciting opportunities out there or may not realize that they are achievable. Randy’s research is focused on the molecular regulation and genetics of a class of proteins called neurotransmitter transporters that clear neurotransmitters from brain synapse, terminating signaling. Among these transporters, Randy currently focuses on transporters that inactivate serotonin, dopamine, and glutamate. The serotonin transporter is a target for the SSRI class of antidepressants, typified by the commonly described medications Prozac, Paxil, and Lexapro. The dopamine transporter is well known as a target for cocaine and amphetamines. Glutamate is the major excitatory neurotransmitter in the mammalian brain, and glutamate transporters ensure that neurons are not “overexcited” by glutamate. In recent years, Randy has focused much of his lab’s work on how human mutations in transporter-encoding genes impact risk for brain, cardiovascular, and neuromuscular disorders. When not thinking about synapses and transporters, Randy relaxes with golf, audiobooks, particularly military nonfiction (check out A Higher Call and The Forgotten 500), and music, typically that of singer-songwriters in the Rock/Folk/Americana traditions such as John Hiatt, Jason Isbell, Lucinda Williams, Patty Griffin, and Darrel Scott. His guilty pleasures are pizza, biographies of comedians (Martin Short and Billy Crystal), and the music of Todd Snider and Jimmy Buffett.